Most of you who are following this blog would love to know the answer today for the question: Is the correction that we are witnessing for the past six months is over? We will definitely answer this by end of this post. However, to start off with, I think one must have a better clarity on correction and counter trend. If you were to watch a business channel and listen to analyst’s appearing in different shows, tend to give different numbers and differ in opinion. Some say, it’s a correction, some others would opinion that the trend has changed and few others would say “adopt a wait and watch policy as there is no trend”. It might be confusing for a person who do not understand technical’s, and might be in a dilemma as to whose view is correct. I would say it’s the perception that differs among analysts. With more than 10,000 indicators, numerous time frames which makes the chartist to look at the same chart, different perception emerges. If you were to observe analysts when the markets are moving one sided, they hardly differ in opinion. The difference of opinion comes only at a time when we see a correction or a counter trend is in place. And understanding counter moves becomes very important. It’s because it can mean only one of the two options, either 1) it can be a correction wherein you get an opportunity to re-enter or average; or 2) it could be a change in trend which gives you an opportunity to exit the current position and build new position on the opposite side. Understanding counter moves are extremely important and am going to make this easier by posting a lesson on it this weekend. For the time being, let’s shift back to Nifty in action. Looking at the move from 7940 in Nifty weekly chart, also looking at the monthly chart and the daily chart, it’s clear that the correction that we have been seeing in Nifty for the past six months is yet to complete. Looking at the volumes especially delivery volumes of the underlying stocks of Nifty, it’s suggesting the correction is not over. We usually see a spurt up in volumes when the correction phase is done signalling smart money re-enters or averages the current holdings. 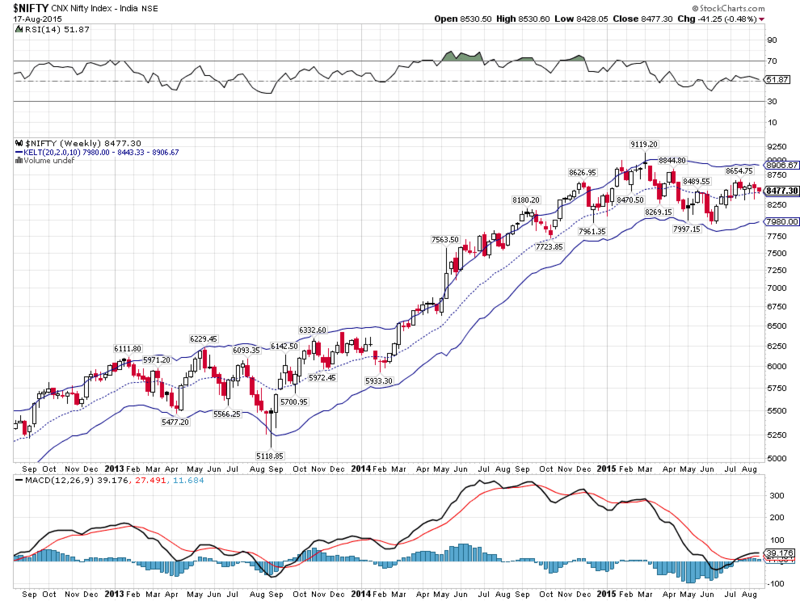 Also technically speaking, the indicators RSI and MACD on the weekly chart still has more room to go downside. How far downside? 8120 is one key number which am eyeing for the current moment, wherein I feel the Nifty’s congestion zone begins. Starting Thursday, we are starting with the daily outlook of Nifty. Watch out for Nifty’s action on day to day basis.